One of my favorite designers, Louise Fili, has revised her site and I can report to say that it is absolutely, deliciously beautiful. If you are not aware of Louise Fili’s work then you are in for a real treat. Louise specializes in logo, package, restaurant, type, book and book jacket design (her three loves are Type, Food, and Italy). From 1976 to 1978 Louise was senior designer for Herb Lubalin. As Art Director for Pantheon Books (1978 to 1989), she designed over 2000 book jackets. Louise also has won numerous awards and medals and has taught and lectured on graphic design and typography. And as if she that’s not enough she has also co-authored (with Steven Heller, Lise Apatoff) and written several books. Her award winning designs and achievements have gained her an induction into the Art Directors Hall of Fame. She’s considered a Design Archaeologist because she searches and hunts down hard to find old typefaces, old books, tins, and other old packaging at flea markets. She’s inspired by 1920s and 1930s design and she masterfully blends these old styles into new simplistic, contemporary designs which have given her a world renowned reputation. You can find photos of Louise’s office and collections at Design*Sponge. If you haven’t been to Design*Sponge yet then I suggest calendaring some time for this site because it’s a given that you’re going to spend hours looking at all the cool and helpful stuff. Inspired by Louise Fili, I designed a label for a batch of homemade coffee liqueur. These bottled treats were given away as Season’s Greetings gifts. You know, those little drawings that you do while talking on the phone, sitting on a bus or train or while you’re in a meeting. Sometimes those doodles are just nonsensical scribbles and sometimes they are masterpieces of art. 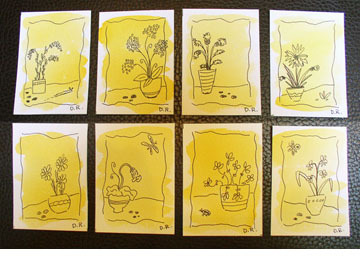 I recently joined a group of creative individuals who in like-mind wanted to exchange these little works of doodle art. Within weeks doodles were doodled and mailed out by the deadline April 15th. I have since received many doodles from across the US and from Canada. The thrill of getting small art pieces from people that I’ve never met face-to-face has been a blast and a not to say the least an inspiration and jolt to my own creativity. For more information about how it all started check out the Doodle Swap Blog. Contact Mary, she’s the head mistress of the Doodle Swap. Here’s the original thread started at the HOW Magazine Lounge Forum. You can also see all the cool doodles that we have exchanged with each other at the Doodle Swap Group Flickr account. Pop-up books (movable books) had captivated my delight while growing up and my love for them has grown and followed me through adulthood. I’ve admired anyone who can take plain paper and turn it into something beautiful. Here’s a little bit about the history behind pop-ups/movable books and some of my favorite pop-up artists. Pop-up books were first called Volvelles and predate the print culture. Ramon Llull (c.1235-1316), a Catalan mystic and poet, created interactive mechanisms (Volvelles) to illustrate his complex philosophical search for truth. Volvelles were used through the eighteenth century for manuscripts and in printed books. They were used for a variety of topics, including natural science, astronomy, mathematics, mysticism, fortune telling, navigation, and medicine. When Turn-Up or Lift-The-Flap mechanisms were introduced in the early fourteenth century they were extensively used to illustrate anatomy. At that time movable books were specifically designed only for adults. It wasn’t until the early nineteenth century that movable books were available for children. Robert and Matthew are master paper engineer partners and have published many children’s pop-up books. 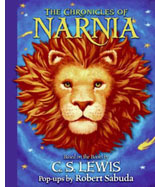 Their most recent pop-up book The Chronicles of Narnia (published in 2007) is richly detailed and has amazing movable elements. Both Robert and Matthew designed an Encyclopedia Prehistorica series that showcases Mega-Beasts, Sharks and Other Sea Monsters, and Dinosaurs: The Definitive Pop-Up. Robert’s visionary adaptation of Alice’s Adventures in Wonderland leaves you in awe and admiration. Robert’s favorite pop-ups are those that are created with white paper. He has been fascinated with how shadows play with paper and his America The Beautiful, Winter’s Tale: An Original Pop-up Journey, and Winter in White: A Mini Pop-up Treat are all based on his shadow play. Of all the books that crack me up, The Pop-Up Book of Phobias and The Pop-Up Book of Nightmares are my favorites. Both books poke fun at phobias and nightmares and are enhanced with macabre artwork (illustrator Balvis Rubess) that suits each topic perfectly. Gary is a nationally touring stand-up comedian and writer and Matthew is a paper sculptor and modelmaker who has created three-dimensional work for hit children’s shows and for other published books. When I first saw the book The Elements of Pop-up: A Pop-Up Book for Aspiring Paper Engineers, I couldn’t get my hands on it quick enough. This book is the definitive book on how to make pop-ups (paper engineering). It covers a wide range of movable elements along with easy, step-by-step instructions and working examples. I love manipulating each example and being in awe at how easy these mechanisms can work such amazing visual magic. Ready to get your creative illustrative juices flowing? 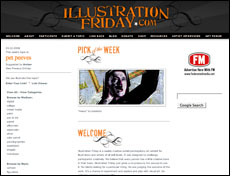 Then go check out Illustration Friday (brainchild of illustrator Penelope Dullaghan). This is a weekly illustration challenge. A topic is posted every Friday and then participants have a week to interpret, illustrate and share. This site is highly inspiring and filled with a wealth of information including a forum where members can share ideas, ask questions and get feedback. For more information about how to join in on the fun visit their Participate page to get the details.